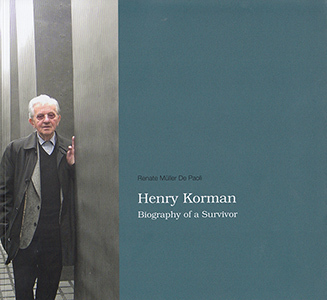 Born in 1920 in the Polish city of Radom, Henry Korman’s fate was decided by the term »essential to the war effort«. He had a »work card«. After the occupation of Poland, his odyssey led him from the Weapons factory in Radom to the Mühlenberg concentration camp. He was forced to toil in Hitler’s flak program on the Hanomag grounds to achieve the »ultimate victory«. Consumed by constant hunger, he survived the death march to Bergen-Belsen where he was liberated on 15 April 1945. In August 1942 »Operation Reinhardt« implemented the »Final Solution of the Jewish Question in Europe« in the »General Government of the Occupied Polish Territories«, measures organized at the Wannsee Conference on 20 January 1942. Henry Korman’s »work card« saved him. His parents and sisters, Hela, Bala and Itka, suffered a different fate. They were deported to the gas chambers of Treblinka. Renate Müller De Paoli, born 1952 in the Hameln-Bad Pyrmont District in Lower Saxony, studied history, philosophy and political science. Today she works as a freelance writer and author, prefering to write about people who are not in the public eye.